TR: I know that Chet was a fan of a good melody. I know he would hum along with tunes. Tell me what you think about that. Did you see Chet as a country artist? What was he if you had to categorize him? SW: I think that’s the neat thing about Chet – the target was moving all the time. No one could pin him into one place. That’s what was beautiful about him – that he didn’t really stay in one place musically. He was as comfortable hanging out with the Beatles as he was with Roy Acuff, you know, and he could play with both of them just as easily. He was so musical – he was just a great music person. I think I feel a lot like the way Chet did. I joke about this sometimes, that there’s really only two kinds of music – good or bad. I either really like it or I don’t like it. It doesn’t matter if it’s country or pop or whatever. Chet was that way – if it had a good melody, he loved that. You’re right – he loved melodies, and if you watch his playing, I think that’s where he stood out from most guitar players or from every guitar player, is with the way he treats the melody. Sometimes guys will come out playing everything at once – Chet used to say “it sounds like they’re getting paid by the note”. They’re playing everything they know right out from the top. But listen to Chet’s records – he’ll actually play the melody, you know? What a concept! TR: That’s a bad sign. Paul and I are really lucky that we had a chance to be around him during all the good musical stuff, but we were also with him when he had some of his illness. I watched how he dealt with some of the down parts of his life, you know, the real down parts. And when he knew he was in trouble with his health, especially at the end there, I watched how he handled a lot of that and, and he was always just so grateful about his life. TR: Have you learned things about the business from Chet? SW: Oh, no question – there’s no question about that. When I got into a bind just as any artist goes through in the music business, I could always come to Chet. The first person I would call with anything would be Chet, and I would come down to his office and we’d talk. He’d say, “What’s going on?” and I’d say, “Well, the label’s wanting me to do this, or they’re asking me to do that.” I would go through it and I’d be real frustrated and disappointed, but he would just help walk me through things. So he was coaching me I guess. There was really nothing I could face or go through in this business that he hadn’t done 20 times, or a hundred times before. TR: I was looking at your Web site, at your discography and all the awards for the different hits and to me, it’s obvious you have a consistency of success over 30 years. You’ve been able to span a long period of time with success while doing a lot of different things. TR: And it worked out. SW: Yes – so I’ve always kind of just done that. I always think that I’m just doing what I do and if that’s good enough, that’s good enough, and if it’s not, that’s OK, too. That’s what Chet did. He just did what he did and he didn’t worry about trying to keep up with the other guy. He just did his own thing. TR: This probably seems like a trivial question, but do you have any favorite Chet recordings you can think of in your mind? SW: I put on “Vincent” every once in a while just to listen to that. I like the last version he did of that, from “Read My Licks”. Every now and then I just need a little dose of Chet, and I’ll listen to that, or – I have several collections that I listen to. I’ll go back and listen to the early RCA years and songs like “Black Mountain Rag” and I like those pretty melody songs. I also like “Blue Angel”. I found a cassette tape the other day. I remember being in Chet’s office one day many years ago and I was trying to play “Blue Angel”. I don’t know how this happened, but he always had a boom box in his office and we recorded tons of stuff on it. I’ve got a bunch of stuff that Chet and I recorded – just us sitting around in his office, and I found a cassette of him teaching me “Blue Angel”. It was a lesson, really – he was going like, “Then you come up here,” and you hear him playing and then he’d say, “And then do this…” . TR: Did it turn into a couple of hours? SW: Yeah, and we’d put down four or five songs and he’d say, “Here’s another song”. He’d name a song to me that was like 150 years old and then he would be mad that I didn’t know it! You know, and it’s a song that was pre-Civil War or something! He knew every song in the history of time, I think. TR: I have heard that from several people. SW: Oh my God, he knew every song – I mean old songs that you just never even heard of. They’d have tricky little things in them, and he’d look at you funny like – sometimes he wouldn’t say anything but you’d miss a note and he’d give you that look like, “You idiot – you don’t know this?” (laughs). I loved it! – I loved when he’d give me that look! TR: I want to ask you about your instrumental CD’s. I’m a big fan of “No More Mr. Nice Guy“, that’s one of my favorites. You took a risk to make that CD and also the “Guitar Christmas” CD, because they’re really guitar CD’s. SW: Yeah, they are – they’re just straight guitar, but you know, every now and then I have to do that. With “No More Mr. Nice Guy, I went to the record label and told them what I wanted to do, told them the concept, and they told me they weren’t going to put anything on the radio. They said we’re not really going to go at radio. I went back to them and said, “Well let me do a guitar record. I’ve always wanted to do this record,” and of course, their answer was,” Naw, I don’t think we can do that,” so it took me a year to talk them into letting me do it. But it turned out they let me do it and they were astounded that I did it on the budget that I did, and that was really the first thing I produced head to toe by myself. One of the funny things about this record was I wrote this song “Big Hero, Little Hero” and there was just kind of a joke because of course Chet was the big hero, so it became a joke – strictly a joke – that he started calling me “little hero”. TR: You’re talking about in his house? SW: -- Yes, we went to his home studio and in my mind, I’m hearing the DelVecchio on that, in my mind – in my mind’s ear I was hearing the DelVecchio for Chet’s part and we go downstairs and he’s kind of warming up, getting ready to record, and when we walked down, it was my biggest fear – I walked down and there’s Chet sitting at his console playing a Stratocaster! SW: -- and I went, “Oh no,” and he was playing some licks and it sounded cool, but it was definitely not the Chet Atkins that I was hearing in my mind on this record, and he was playing along with the track with the Stratocaster, and I didn’t know what to do. It took me almost 45 minutes to get any nerve to say something. In my mind I’m mulling it around, going like, I’m producing this record, but I’m thinking, how in the world am I going to tell “Mr. Guitar” to not play that? – “Do you mind putting that guitar down,” you know, and I mean, I don’t want to try to produce Chet Atkins. So finally I just kind of worked it around where we took a couple of takes on the Strat and I was thinking, “I gotta say or do something”. Randy and I were reading each other’s mind, you know, and so finally, I go, “you know Chet, I’m thinking of something a little different – maybe more acoustic sounding on this.” I was nervous, too. “Maybe we should try something acoustic – what do you think about that?” And he looks at me and says, “Well let me try this DelVecchio,” and I went, “Oh yes!” (laughs). In my mind, I’m saying, “Yeah – yeah, yeah!” And so he picked up his DelVecchio and it was butter. In my mind I was high-fiving, you know? TR: Well, you probably learned that you could approach him. SW: Oh, I knew I could – I was just intimidated. I was just scared, and that’s something with Chet that way early on I tried to get over and I did for the most part. But every now and then you’d still be reminded. He told me early on – he just nailed me one day. He said, “You gotta quit that”. He could tell I was intimidated around him but that was mostly early on. TR: Well he saw that a lot, I’m sure. SW: Oh yeah. He was used to reading that in people. TR: How were you with the other artists on that CD? I mean you had a big array of different people. Did they all have fun doing it? SW: Oh yeah, it was a blast. SW: Yeah, Leo Kottke and Larry Carlton, Mac McAnally. I had the guys like Sam Bush, Carl Jackson, Jimmy Olander and Mark O’Conner, Bela Fleck, Richie Sambora, Lee Roy Parnell – I’m afraid if I try to name them all, I might leave folks out. Of course, Randy Goodrum was a real big part of that project. There weren’t a lot of finger-pickers though as I look back on that. I called Eric Johnson to play on it and he was going through health problem and he couldn’t play on it, which disappointed me. He’s such a great player and friend, I was disappointed. That was a great band, but people would laugh if they saw how I recorded that though. It was amazing. I did it totally on ADAT, on an O2R and some of the tracking I did in the Bennett House and some other places, but I brought it back to my place. I had to because the label wouldn’t give me any kind of budget, you know. I had to do it how I could do it. Richie Sambora did his guitar parts in a little ADAT studio in Singapore. SW: I sent him the tapes. They were on tour in Asia, and he told me later, he said, “Man, you wouldn’t believe it. I found this little studio in Singapore,” and he goes, “The guy couldn’t speak English,” and he said it was a comedy, you know, and he put down tracks and sent it back to me. I got my two ADATs back in the mail. SW: It was amazing, you know, but one of the proudest moments for me, was when I signed with Capitol and Chet was already starting to be sick, really sick and “Holes in the Floor of Heaven” had just won the awards and was real big and everything was clicking. About that time, my album “Burnin’ the Roadhouse Down” was finished and that was the first commercial thing where I was producing all my own stuff. 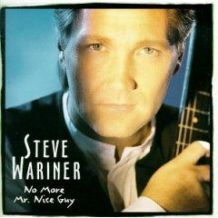 At that point I had done “No More Mr. Nice Guy”, the guitar album but really had just started coming into my own as a producer. But this was the first stuff I really did by myself and anyway, Chet and (his wife) Leona really loved “Holes in the Floor of Heaven.” Sometimes when I was over at their house Chet would point to a guitar and say “Do that ‘Holes in the Floor of Heaven’ for Leona” and I would do it and I would always gladly do it, which made me proud. But when the whole album was done, I was talking to Chet one day and he said, “Man, why don’t you bring it over here ‘cause I want to hear it,” So I went over to his house and we sat at his kitchen table and he had a Bose portable system, the top-loading one where you put CD in the top – and we sat at the table and I was going to play him a few cuts. I wasn’t going to play him everything – it was like 12 tracks or something, but I thought, well, I’ll play him a few tracks, a couple of highlights ‘cause I know he liked “Holes”. So we sat at his kitchen table and I put in the disc and I played a couple of tracks. “Burnin’ the Roadhouse Down” was the song that started first. Buddy Emmons played this cool solo, and then it went into “Holes in the Floor of Heaven” and then, and then – I forget the other tracks. I played about three or four tracks and I stopped. I reached up and stopped it and Chet just looked me and he goes, “Man, that’s really good.” He goes, “Way to go – that’s really good,” and then so I stopped it – I reached up and stopped it and he goes, “What are you doing?” and I said, “I just wanted to play you a few things,” and he pushed play again and he goes, “No, I want to hear all of this. I want to hear what you did,” and he wouldn’t let me stop. We listened from head to toe. I played him the whole album – all 12 tracks and when it got done, he looked at me and he kinda did his crooked smile thing and he looked at me and said, “Well, I guess I did something right,” and man – that made me feel so proud, you know? I took it that he was referring to the fact that he “discovered” me and signed me as a recording artist and I really loved that. That was so cool. TR: That is very cool. That’s a great story. What an eye for talent he had, and for developing people. SW: Oh, there’s no question on that one. I was so proud to be in on that bunch. I saw a roster in his office one day of all the people either he had signed or produced or both, and it was three pages of “Who’s Who” in the world of music. I mean, it was unbelievable all the names on there. TR: Did you ever play with Jerry Reed? I wondered if you played on tracks with him. Or on stage, did you play with him? SW: A little bit but not very much. I mean I really played with him more in the later days. He recorded out here at my studio about four years ago. SW: Yeah. He cut some things out here and we got to hang out a little bit. But I never did play with him much. TR: “Pickin” is just great – what an album. SW: What a monster, you know? I’ve really been in touch with Jerry more in these later days. I’ll call and talk to him and check on him and stuff, but I never did play much. I mean, shoot – I would have been intimidated to play around him too. But I’ll tell you something that you probably don’t know. I have started a new project which is really part 2 of “No More Mr. Nice Guy”, but it’s really a tribute to Chet, a concept album of sorts. And I think its going to be very different. I’ve got about eight tracks done so far, the tracks – I’m still working on some of the guitar stuff, but it’s really not going to have a lot of guests. James Burton is going to play on one track and Paul Yandell played on one and he’s going to play on another. I’m going to ask Ricky Skaggs to play on a thing, and it would be kind of like Jethro Burns style. (Chet’s brother-in-law Jethro Burns). I’m going for the style of Chet’s records throughout each era he played. However, the first thing I’m going to say in my liner notes is, “You can’t out-Chet Chet, and that’s not what I’m trying to do here.” I’m trying to honor and pay tribute to him and I’ve done a lot of research on this, on the sounds, the songs and the equipment throughout Chet’s career. The project has been in my mind for about four or five years. TR: So it’s chronological in a way? SW: -- Yes, It goes from this era to the next and the next – finally it comes to what I call the “Stay Tuned” era where he was doing that more jazzy stuff like he did with George Benson. And then it comes all the way up to his modern times to the very last stuff that he did and I’m kind of representing most of those eras, especially concentrating on my favorite era which is early ‘60’s, up through the Beatle era kind of thing. So anyway, that’s what I’m working on. And I’m playing different guitars and even a couple Chet gave me through the years. I’ve got a guitar now that Paul is letting me borrow that’s got one of Chet’s old pickups in it. I have an old 1949 Fender Deluxe I’m using to try to get different sounds. I’ve been using a tape delay and play through the ’49 Deluxe. I’m using an old RCA ’77 ribbon mike and I’m really keeping it authentic, as best I can. I’m trying to use stuff representative of the eras. TR: Paul’s a really good person to ask about stuff like that, the equipment. SW: Oh, no question, he’s fantastic with the gear and he sure has been a good friend through the years. But I’d love for you to hear some of it. I think you’ll like it. Pretty soon I’m going to put some samples on my website, I’m going to try and have it all done for Christmas. TR: I’d love to hear it. And thanks for taking the time to talk today.